Finally, a toy in constant use! Life is just so much easier with superMOPI! Looking for a toy that is proven and novel at the same time? superMOPI is still new in the US – but huge in Europe. superMOPI is the lightest ride-on toy on the market. Toddlers as young as 18 months can ride and carry it along. No heavy schlepping for parents either. Steering makes it fun and enhances kids’ coordination. Toddlers learn to push with feet on the ground, speed up, chase each other, zigzag, and do all sorts of tricks. Balancing is not a prerequisite but develops gradually. Hence superMOPI riders learn to ride a real bike faster. Builds muscles, gross motor skills, stamina, and endurance. Promotes self-confidence and independence. A fun and convenient stroller alternative, promoting a healthy, active life-style from this early age. 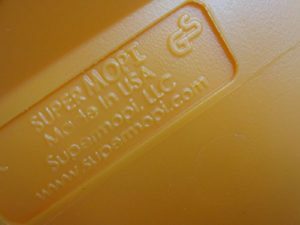 Today superMOPI is proudly manufactured in the US and shipped to all states. The ingenious design comes from Hungary, perfected over decades by our friend, inventor, architect, and loving father who made the first prototype for his own daughter some 30 years ago. So how did our MOPI story start? 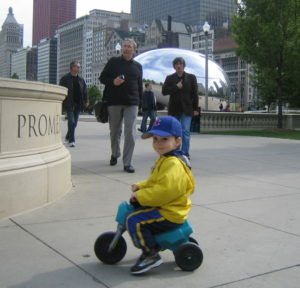 As our 2-year-old cruised the streets of Chicago, it was a show. But it was not his pretty face that earned him the sudden surge of attention. All that rubbernecking was due to his cool riding. Clearly, it was high time Chicagoans got to know his ride-on toy better. So we brought the toy to the US to delight American toddlers – and those who love them. Like you! That’s how superMOPI was born in 2008.